Foundations are the key element in the interaction between the ground and the structures above it. 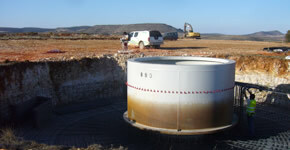 A thorough understanding on the ground conditions of a site is a pre-requisite to the success of a foundation project. Geophysics provides valuable information such as bedrock depth, ground mechanical parameters, detection of voids, water table presence. 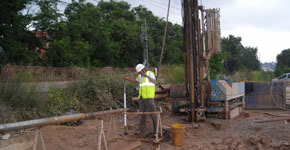 Many problems regarding foundation design can be solved with the use of the appropriate geophysical technique. GPR is a well known technique to map in detail the interior of concrete slabs. Details pertaining the slab structure (number and distribution of rebars, cracks, voids or even the degree of concrete alteration) can be imaged. Incorporating state-of-the-art GPR technology (3D-Radar) 3D models of large areas are now created with unprecedented resolution and unbeaten fieldwork acquisition velocity, minimizing impact costs at the site. The interior of a pillar is in most cases not as regular and homogeneous as we may think. Diverse geophysical techniques allow us to identify hidden defects in pillars (craks or voids), to calculate the dynamic moduli of the pillar at different points, to determine the type of reinforcement, humidity accumulation, etc. 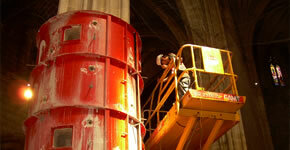 In restoration projects of old pillars (churches, cathedrals, etc) it is important to know these parameters in great detail because a pillar supporting less load than the others (or viceversa) can create a catastrophic collapse of the overlying structure. A very common problem in ground treatments is to determine the effectiveness of the treatment and to confirm its spatial coverage. A Geophysical techniques are used before and after the treatment in order to compare certain ground parameters and their variation associated with the treatment. In some cases the treatment continues until a certain required condition (usually a given value of the elastic modulus) is achieved, thus avoiding unnecessary costs by an excessive treatment or, in the opposite case, stopping the treatment before reaching the required value. Blasting, excavation works, railway traffic or even wind can induce vibrations in buildings and other structures causing in some cases serious consequences. Measurements can be remotely controlled and real-time response is achieved by triggering alarms when certain levels are surpassed. Clients can monitor from their office or mobile device vibration data of their target of interest.